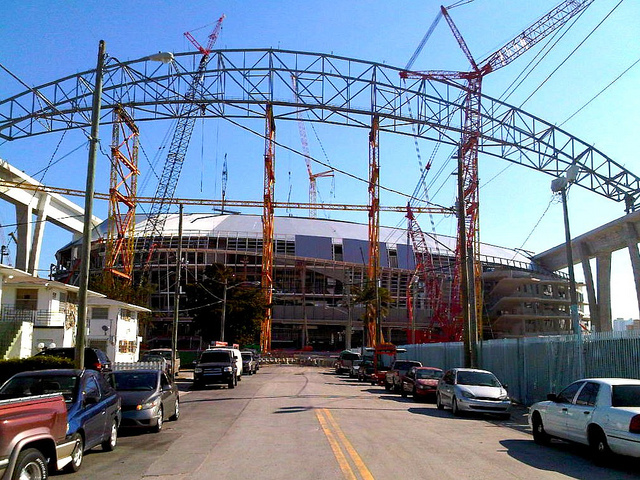 The new Marlins stadium was a work in progress in January. In a perfect world, Ozzie Guillen should be able to say whatever he wants. But then, in a perfect world, Guillen might have his wits about him, or he’d be so perfect as to be unrecognizable as the buffoon we’ve come to know. His latest contratemps? He loves Fidel Castro, he respects the Comandante’s ability to survive all these years against so many adversaries. The second part of that is no big deal: Some of Castro’s biggest haters respect the former dictator’s genius for survival. But the first part of that? Big no no. Sure, sure, freedom of speech -- Guillen should be able to love anyone, and the Nazis should be able to march in Skokie. But here’s the deal in our very imperfect world: The Miami Marlins are trying to rebrand as a team beloved by its Latino neighbors, and by Latinos I really mean mostly baseball fanatic Cuban-Americans. The new stadium, a nearly $700 million monstrosity, has been built in Little Havana, spitting distance from the Bay of Pigs Memorial, ground zero for Castro-hating Cuban exiles, Nicaraguans displaced by the Sandinistas and Venezuelans who hate Hugo Chávez. Little Havana, more than being Cuban, is the epicenter for commie hating Latinos. And here’s the kicker: The $700 million to build the new stadium is mostly taxpayer money. In other words, money that came out of the pocket of Miami residents, including those anti-Castro Cubans who are now up in arms about Guillen’s comments. Guillen, by the way, apologized for the comments, said he was thinking in Spanish and trying to talk in English and his signals got crossed - which is, frankly, utter BS. He got a 5 game suspension in spite of all that theatrical contrition. Who cares about any of this? Well, in spite of the international headlines, apparently not a plurality of Miamians: according to a Miami Herald poll, a 38% don’t even think Guillen’s five day suspension is necessary, 33% think the punishment fits the stupidity. In the meantime, the dinosaurs who populate rabid anti-Castro stations like WQBA must be delighted. After weeks of talking about the pope in Cuba, and Chilean communist youth leader Camila Vallejo’s visit to the island, Guillen has given them the gift of continued outrage.